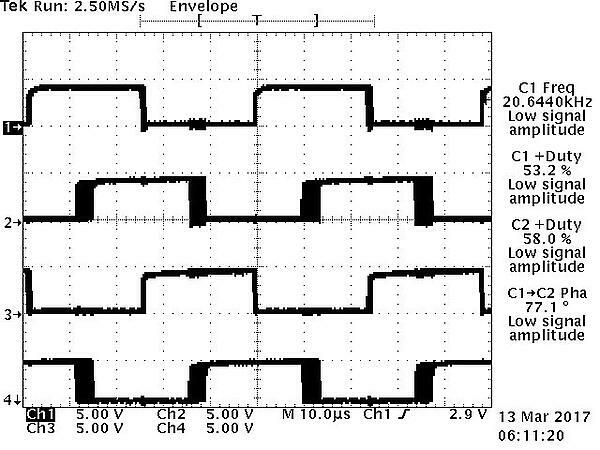 Encoder signal jitter is an inconsistency in encoder pulse shape in relation to another channel, often appearing as a backwards and forwards movement in the pulse. In the case of true signal jitter, the effect should show up on just one channel versus on all channels. The channel that provides the trigger stays well behaved and the other channel appears to move back and forth, extending and contracting periodically. Triggering from the other channel will reverse the effect; the trigger channel remains static and the other channel appears to extend. This effect is typically caused by jitter internal to the encoder, which is introduced by the code disc being decentered. As the disc turns, the physical channels appear to move relative to one another. This affects the timing of the pulse streams, making the phasing between channel A and channel B change with every rotation. Frequently, signal issues categorized as jitter are caused by other error sources, so it is important to be methodical in the troubleshooting process. Does the effect appear on only one channel? Do the pulse edges appear to move back and forth? Does the error change channels when the trigger is changed from one channel to the other? Although jitter can be a serious issue, it is easy to confuse with other phenomena like interpolation flicker. It’s important to note that all encoders have some negligible amount of jitter as a result of the physics of the devices. The question to answer is whether the device is operating within spec. If it is not operating within spec, and if the behavior shown above appears, users should reach out to their applications engineering team to isolate the problem.